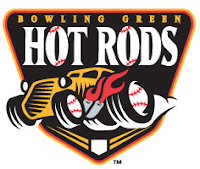 Bowling Green, KY - Hot Rods infielder Tyler Bortnick had three hits and drove in two runs on Friday night, but the Hot Rods couldn't overcome four errors in the field in a 6-4 loss to the Fort Wayne TinCaps (5-3, 41-37). The loss leaves the Hot Rods (4-4, 35-42) with their first losing skid of the second half and in need of a win on Saturday night to avoid a series sweep. Bortnick's big night began in the first inning with a one-out single that scored Brett Nommensen to give the Hot Rods an early 1-0 lead. After Mark Thomas flied to right, Bortnick scored on a double by Ryan Wiegand that filled the gap in left-center field to make it 2-0 Hot Rods. The lead was short-lived as Wilking Rodriguez and the defense struggled in the top of the second. Jason Hagerty reached on an error by Bennett Davis and eventually came around to score on a single by Daniel Meeley. A second run scored a few batters later on a two-out Dean Anna single to tie the game at 2-2. An inning later the TinCaps took their first lead of the game on a double miscue by Davis. With one out and a man at third, Jeudy Valdez hit a ground ball back to the mound. Rodriguez fielded it and threw to third, but Davis dropped the ball, allowing Payne to score. Davis compounded the error by throwing wildly to first base to allow Valdez to advance to second. Rodriguez would get out of the inning without further damage, but the TinCaps had another unearned run. Bowling Green took advantage of some sloppy TinCaps fielding in the third. With one out, Robi Estrada walked and stole second in front of a Bortnick strikeout. That brought up Mark Thomas, who hit an infield single into the hole at shortstop. On the play, Dean Anna bobbled the ball, which allowed Estrada to score all the way from second base. In the fourth, the TinCaps took the lead right away against Rodriguez when Edinson Rincon homered into the right field bullpen and Danny Payne hit a bases-loaded sacrifice fly to put the 'Caps on top 5-3. Bowling Green made two more attempts to rally. In the fifth, Bortnick came through with another run-scoring hit, driving in Nommensen to cut the deficit to 5-4. Three innings later Bortnick singled again and stole second before Wiegand drew a one-out walk. That brought up Gabe Cohen, who ended the inning by hitting into a double play. The TinCaps put the game away in the top of the ninth with an insurance run on a Valdez homer to make it 6-4. Rodriguez took the loss, his fourth straight of the season to fall to 4-7. He lasted 3.1 innings, giving up three earned runs (five total) on five hits, one walk, and four strikeouts. Mavarez worked three scoreless before Alex Koronis allowed the Valdez homer for his only blemish over 2.2 innings. The Hot Rods will try to avoid the series sweep in the series finale on Saturday night. RHP Jason McEachern (3-6, 4.67) takes on Fort Wayne LHP (4-4, 4.60). First pitch is at 7:05 PM. After the game the Hot Rods will launch special post-game fireworks to celebrate Independence Day courtesy of State Farm and Western Kentucky Orthopaedic & Neurosurgical Associates. For tickets, visit www.bghotrods.com, call 270.901.2121, or head to the Ticket Office at Bowling Green Ballpark. You can listen to the game with Tom Gauthier and Hank Fuerst beginning at 6:50 on 1340 AM WBGN and www.bghotrods.com.